It is a very conventional compass, floating in oil in a non-magnetic brass casing. Our friend was concerned about the radiation symbol on the cover: as it turns out, this particular compass had fluorescent markings that were illuminated by the presence of small amounts of radioactive tritium. As tritium is a low-energy beta emitter, it poses almost no health risk (unless you happen to inhale or consume some quantities of it) and thus it is safe for use as a form of “permanent illumination”. Unfortunately, tritium is also used in thermonuclear weapons, so its possession and sale are often regulated. 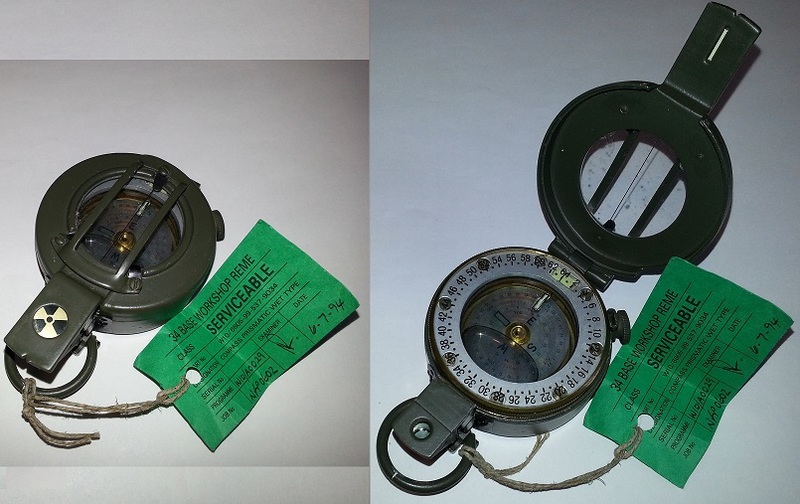 In any case, this old compass is long past its “use before” date; I don’t know how old it actually is, but its inspection sticker dates back from 1994. The tritium appears to be long gone (not exactly a surprise, given tritium’s relatively short, 12.3 year half life), as the marking are completely dark. Still it is a beautiful device, and I am very grateful to our friend for offering this to me as a gift. It will be cherished.